Taiwan's hand-tool industry has developed strongly for many years to become a key player in the international market for high-quality, innovative, and reasonably priced products to global users, especially in the professional and industrial application segments. Despite its solid foothold in the global market, Taiwan's hand-tool industry still faces challenges ahead, not so much from low-cost competitors as from the difficulty of developing in high-end markets and upgrading technologically to meet the niche's needs while going face-to-face with international brands. One person who saw this looming challenge before most is Brand Hsiao, marketing director at Stand Tools Enterprise Co., Ltd. He sheds some light on how Taiwanese hand-tool makers can advance in the new business terrain they face ahead. Founded in 1988, Stand Tools is an internationally reputed tool manufacturer with a broad line of products including ratcheting screwdrivers and magnet-integrated products, such as multifunctional holders, boxes, hangers, sweepers, trays, and related products. Besides having won a dozen awards from the government for excellent R&D, the company is also a leading original design manufacturer (ODM) of hand tools in Taiwan. The company enjoys a solid position in the global ratchet and magnet-integrated tool market, but the company's younger-generation management decided to take the firm in a new direction a few years ago. Under this vision, Stand Tools aims to become the world's leading manufacturer of high-end digital torque wrenches. 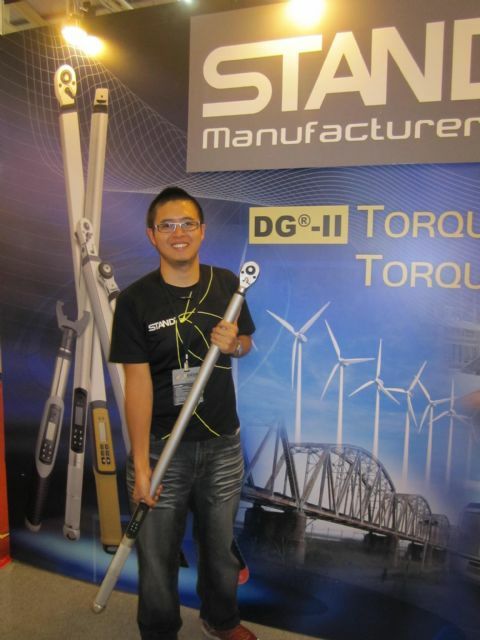 Stand Tools launched its first micro-electromechanical systems (MEMS) sensor-integrated digital torque wrench in 2009, after a long-term R&D effort dating back to 2000. Sales of the new product have been growing rapidly, especially in China, as the company continues to introduce new models. "One of the most important things when upgrading the added value of a product is to provide trustworthy testing documentation for customers to prove that our digital torque wrenches provide a reliable level of precision," Hsiao says. "Many tool manufacturers might opt to invest more in product styling and functionality upgrading, which are correct and necessary, but the investment in setting up a Taiwan Accreditation Foundation (TAF) certified lab is more fundamental." Stand Tools was the first hand tool manufacturer in Taiwan to set up a TAF certified lab with torque testing devices, Hsiao says. He firmly believes that excellence in digital torque wrench technology hinges on the precision and accuracy of the torque force applied. 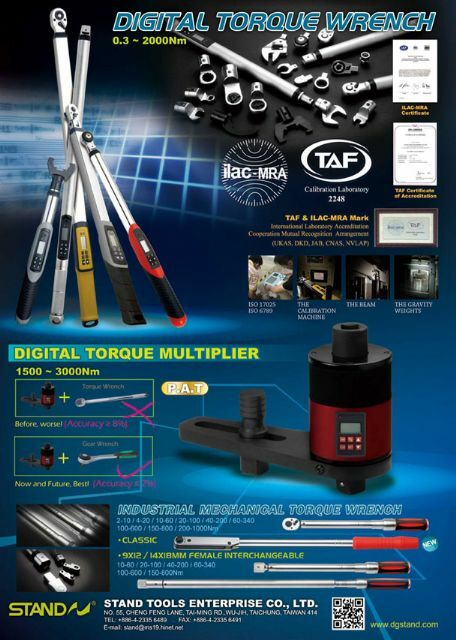 Stand Tools offers high-level digital torque wrenches approved by the company's in-house TAF-certified toque testing and calibration lab. The company's TAF-certified Testing & Calibration Lab follows all ISO:17025 standards and local laws. Above all, Hsiao stresses, accuracy in torque wrenches helps to ensure product safety. For example, improperly torqued fasteners on carbon fiber bike frames can undermine structural strength and cause sudden breakage under vibration. By building an internationally-recognized testing and calibrating lab, Stand Tools can perform test more efficiently and at a lower cost than if it had to outsource such services. "Establishing an in-house TAF-certified testing and calibrating lab is usually not a practical option for any but the largest enterprises in Taiwan due to the considerable investment involved. But the payoff in quality, trustworthiness and accuracy convinced Stand Tools that this was the right way to go," Hsiao says. "It took us about NT$10 million (US$333,333) and two years to build and equip the lab." He points out that the TAF is the only national laboratory accreditation institute in Taiwan that assesses local organizations by evaluating competence in specific certifications, calibrations, testing and inspections, as well as providing proficiency testing services. Hsiao's other observation on the future of Taiwan's hand tool industry is the importance of the booming Chinese market. He admits, though, that many Taiwanese companies are afraid of having their ideas stolen by competitors in the huge market." Stand Tools set up a branch office in Xiamen, Fujian Province of China, several years ago. The company has partnered with various tool brands in China. The mainland is the company's largest market for torque wrench products and sales there are growing rapidly. "We are also hopeful that torque wrenches will be included for tariff reduction or exemption under the Economic Cooperation Framework Agreement (ECFA) signed between China and Taiwan," Hsiao says. "The agreement is expected to have a noticeable impact on cross-strait trade in the hand tool and other hardware segments." "The reason that I have been urging Taiwanese hand tool manufacturers to shift their focus to China is that numerous and big construction projects and strong industrial development there are creating a huge demand for high-quality hand tools made by Taiwanese suppliers," Hsiao says. One of the most obvious examples is China's 12th Five-Year Plan for National Economic and Social Development (FYP) from 2011 to 2015, which calls for upgrading quality of construction projects. The fear in China now is not so much the lack of money as a failure to hit goals after the money is spent. So, high quality and functional tools are hot items in the booming market, which also explains the strong sales of high-price tools by international brands. The huge demand for torque wrenches in China comes mainly from the railway (high speed railways, subway systems, etc. ), power generation, defense, and automotive industries (production and repair/maintenance), Hsiao says. Currently, the major export markets for Stand Tools' torque wrenches include China (the biggest), Japan, and Europe. In 2014, the company is focusing on exploring the U.S. market. "In developing the global market, we do not insist on using our own brand," points out Hsiao, who is also the marketing manager at his company. "Rather we follow a concept more like the 'Intel-inside' by supplying core digital torque-wrench solutions featuring highest quality and precision level. Under such strategy, Stand Tools cooperates with different local brands to increase market share." "China is expected to outperform the U.S. to become the world's largest consumer market in the near future," Hsiao says, "And why shouldn't Taiwanese suppliers of high-level hand tools pull ahead of American, Japanese and European rivals in the booming market? We know that if Stand Tools wants to defeat European and American giants in the world's next biggest market, we have to first cooperate with Chinese partners." Hsiao says that the booming Chinese market is also providing a clear sign that wrench demand will grow, especially for machinery, transportation vehicle, and medical applications. There will also be increasing demand for newer and better models, including digital torque wrenches. "We expect the torque wrench market to be split equally between conventional models with mechanical torque gauges and digital models."